Those unfamiliar with one of England’s greatest drummers, may yet recognize his impressive work with some of the most successful progressive rock groups of the 1970’s and 1980’s: Yes, King Crimson, and Genesis to name but a few. However, by the 1990’s, Bruford had eshewed that genre to play what was his first love: Jazz. In 1986 he formed the critically acclaimed “Earthworks”, an ensemble featuring acoustic bass, keyboards, saxaphone, and Bruford on a 12 piece electronic drum kit, capable of playing complex chords as well as percussion samples. After over ten years of successful touring around the world, and a few line-up changes later, the Bay Area found his latest incarnation in a rare west coast appearance at Yoshi’s last year, resulting in his latest recording, “Random Acts of Happiness”. Rare indeed, as Bruford told me that “flying his group to the west coast of the U.S. can be a rather costly endeavour”. Switching now to an all acoustic drum kit, Bruford’s current Earthworks band, now features the inimitable Tim Garland, (formerly of Chick Corea’s band and replacing Patrick Clahar), on assorted reeds and flute, clearly excels at the riskier environment of the concert stage. Even more adventurous than his last recording, “Footloose and Fancy Free, Live in NYC”, “Random Acts of Happiness” benefits from an even better recorded sound, and a repertoire that shows the group still growing, interestingly enough as much by looking back as it does by looking forward. Garland has taken over the lion’s share of new compositions, and his penchant for extended composition which has worked so well in his other endeavors, most notably Acoustic Triangle and his Storms/Nocturnes Trio, works to advantage here as well. “White Knuckle Wedding,” with its long-and-winding melody, also features Garland on flute, which adds another texture to the ensemble. Also, while Earthworks remains an essentially acoustic ensemble, Garland is not afraid to dabble with electronics, using a pitch-shifter to create a somewhat oriental flavour towards the end of the piece; he also pitch-shifts his saxophone on “Speaking With Wooden Tongues,” which may be the most remarkable new piece in the Earthworks songbook, shifting from light counterpoint to intense improvisation. 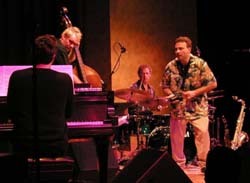 “Tramontana,” co-written with the recently departed pianist Steve Hamilton, as well as “Bajo Del Sol,” with their Latin-leanings, demonstrate some of the influence that Chick Corea had on Garland while a member of Corea’s group, Origin. But in the hands of polyrhythmist Bruford, the pieces become something more as well. In fact, one of the most attractive things about this group is how they create shifts in feel, always keeping things interesting. Bruford’s mathematical precision on pieces like “Modern Folk,” coupled with his looser approach on “Bajo Del Sol,” shows an artist who, considering his already-established stature continues to look for new inspiration and further develop his sound and approach. In addition to revisiting previous Earthworks pieces for the balance of this recording, Bruford has also chosen to look back at his twenty-five year-old repertoire, and select earlier pieces for reinvention. “My Heart Declares A Holiday,” which comes from the first Earthworks album, a revived “Seems Like a Lifetime Ago (part 1)” and “One of a Kind (Parts 1 and 2),” which come from his more fusion-oriented period of the late-1970s, prove that strong material is strong material, regardless of the context in which it is placed. It is interesting, in fact, how things that were, at the time, considered to be signature, like Allan Holdsworth’s guitar or Bruford’s chordal drums, become completely irrelevant in these new arrangements as the ensemble both pays reverence to the source and takes the material to new places. Personally, I’ve always been partial to Bruford’s original Earthworks line-up of punk-jazz British musicians Ian Ballamy, Django Bates, Mick Hutton and later Tim Harries. Ironically, I can recall saying the same thing about his late ’70’s group with Dave Stewart, Jeff Berlin, Allan Holdsworth, and again later, the “unknown” John Clarke! Bruford’s keen syncopation, and his constant forward thinking, (he was the first great electronic drummer), help to make “Random Acts of Happiness” another fine album in his ever growing catalogue of modern jazz recordings.